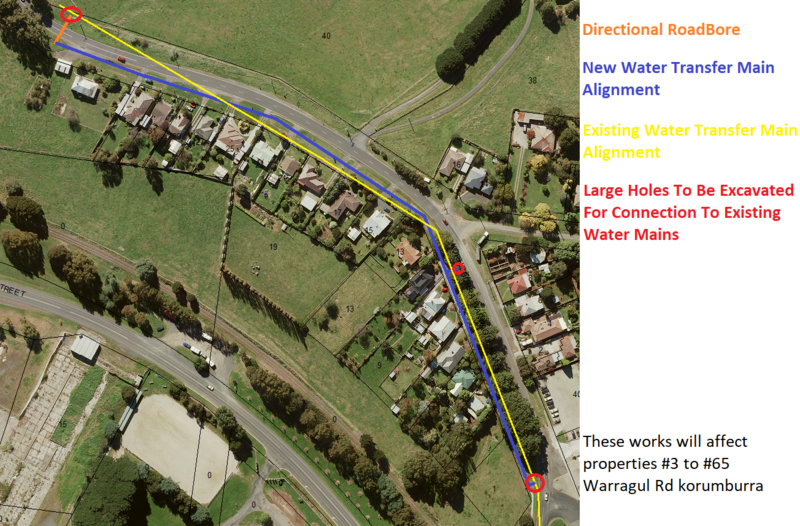 South Gippsland Water will shortly begin works to replace a section of the main water transfer pipeline which runs between the Water Treatment Plant and the Korumburra Township, along Warragul Road, Korumburra. Commencing in mid-November, a 500M long section of pipe will be replaced. The section of pipeline to be replaced is some 60 years old and has been the subject of bursts and leaks over recent years. The existing 300mm cement pipe will be replaced with a 375mm polyethylene (PE) pipe. Given its location and key role in the delivery of water, these works are considered major works and of a high priority to ensure reliable services. Managing Director Philippe du Plessis said that, “the Corporation has been monitoring the performance of this section of pipe over recent years and has identified it as a key priority for replacement. This projects marks a $500,000 investment into the Korumburra Water Supply System and the Corporation’s commitment to deliver safe reliable water supplies”. The works which are expected to take three to four months to complete, commencing mid-November, will be conducted along the road reserve and nature strips of Warragul Road. Beginning near the intersection of Warragul Road and Station Street and extending up the hill 500m as you exit the town, affecting properties numbered 3 to 65 Warragul Road Korumburra. Construction works will involve open trenches to lay the majority of the pipeline with a short section to be directionally drilled under the road. A number of large pits will be required at key valve and tapping locations. Property owners in the immediate vicinity will be consulted and kept up to date through-out construction and will be informed of any planned service disruption or impacts to their properties. Any customers who have questions or concerns regarding their water supply can contact South Gippsland Water’s friendly Customer Service Team on 1300 851 636. For enquiries specific to this project contact Project Supervisor, Nathan McRae 03 5682 0458.